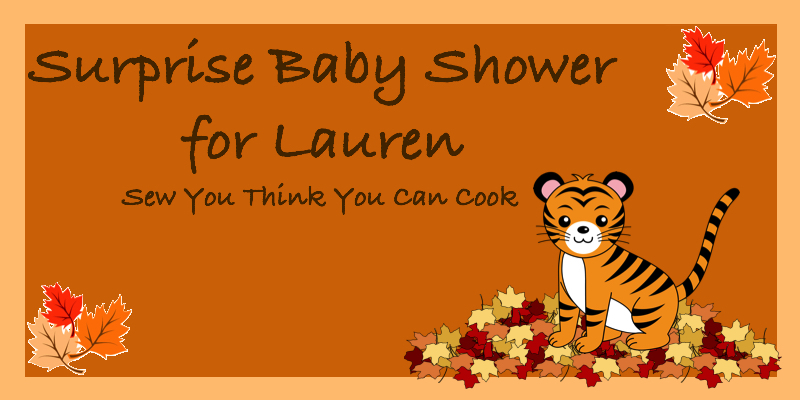 When Tara from Tara's Multicultural Table asked if I would like to be a part of a virtual baby shower for Lauren of Sew You Think You Can Cook, I jumped at the chance. Then I heard that she is due in November and Thanksgiving is her favorite holiday, so we were going to do Thanksgiving themed recipes. My mind really got going then! Thanksgiving is my favorite holiday too! I love the food, the family and the football! I thought about doing one of the classics. I couldn't commit to any of them. My family's Thanksgiving spread is usually enormous; Turkey, a rice stuffing, oyster stuffing, stove top stuffing, sweet potato casserole, candied sweet potatoes with marshmallows, baked sweet potatoes, green bean casserole, green beans, corn, rolls, mashed potatoes, gravy, the famous frozen fruit salad. Then of course there is dessert, last year there were no less than 8 pies, a cake and some cookies. You know we love our pie after our pecan pie throw down this summer, but I didn't want to revisit that. And of course there are always the egg noodles, we used to always have them on Thanksgiving and now normally have them the weekend after. It is WAY to hard to pick just one of those things to share. So, I decided to focus on a great Thanksgiving morning breakfast. This is a great way to get a little of that sweet pumpkin fix in the morning. People can cut a slice as they wake up and it will help hold them over until the big meal. The pumpkin roll is delicious on it's own, but in my opinion the maple browned sugar glaze really sets it over the top. My first thought was I would do a cream cheese glaze, but MiMi said that was too obvious. She mentioned browned butter, I twisted it with some maple and a masterpiece was born! The warmth of the maple and browned butter just melt into the pumpkin pie spiced filling and it almost melts in your mouth. I hope Lauren enjoys this slice of cinnamon roll and has a chance to kick her feet up for a few minutes to enjoy her virtual shower. It sounds like this Thanksgiving will be extra special with a new little bundle of joy to be thankful for! In a saucepan over medium-low heat, melt the butter. Once the butter is melted, add the milk until scalded. (You want it to get pretty warm, but not boil.) Remove from heat and let cool a bit. Meanwhile, in your mixer bowl stir together the flour (start with three cups, you can add more later if you need it), sugar, pumpkin pie spice and yeast. Check your milk mixture to be sure it isn't too hot (you don't want to kill the yeast. It can be hotter than warm but not burn you hot. You with me?) If it isn't too hot, slowly drizzle it into your dough mixture with the hook going on slow. Check your consistency. Add a little more flour or milk if it needs it. Place dough in a greased bowl. Cover and let rise in a warm spot until doubled in size, it took mine about an hour and a half. Roll your dough out into a large rectangle about 1/2" thick. Spread very soft butter over the dough. Sprinkle with brown sugar. Dust with pumpkin pie spice and cinnamon. Gently place the other strips around the center to make one large cinnamon roll. Don't worry about making it perfect or getting them too tight. The roll will push out as it rises. I made my dough the night before, so I wrapped the skillet in plastic wrap at this point and placed it in the fridge. You could also just wrap it in plastic wrap and let it rise right away. Either way, it should double in size again before it is baked. This should take about another hour in a warm spot without being refrigerated, a bit longer if they are starting cold. I went ahead and preheated my oven to 200 F, turned it off and stuck the roll in the oven to rise to make it go a little faster. Preheat the oven to 375 (don't forget to take the skillet out of you let it rise in there!) and remove the plastic wrap. Bake the roll for about 15-20 minutes. You want it to start getting a little golden, but you don't want it to go too far. Soft and luscious is better! Remove from oven and make your glaze while it starts to cool. Drizzle glaze over roll while still warm. This is best eaten still warm from the oven with a gooey glaze. Leftovers are good too, just give them a little zap in the microwave and they'll be almost as good as new! Lauren is a lucky girl. This is most likely the tastiest virtual baby shower ever. Starting the day off with your creative cinnamon roll would be perfect. I hope there is plenty of time to take a walk to make room for the other goodies. There should be plenty of time and it would definitely be worth the risk! Otherwise you'll just have to make it an elastic waste band day! Oh wow! This looks absolutely delicious and that glaze! Will definitely be making this. Thanks so much for joining me in celebrating Lauren! Thanks for getting it together, everybody made such amazing looking treats for the shower! Oh man this looks delicious! I adore cinnamon rolls. I actually almost picked a cinnamon roll recipe too. It really was very good! It just seems like pumpkin and cinnamon rolls are meant to be together! 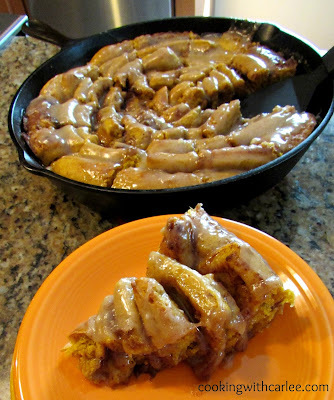 Pumpkin cinnamon rolls...I think I have just died and gone to heaven. They are pretty darn good if I do say so myself! WOW and I thought our Thanksgiving menu was too big! Your cinnamon roll looks incredible and I love that it's one giant one, too. It is crazy! I am one of six and my dad is one of six, so there are a lot of us and we all love to eat. I really need to get a picture of the spread this year. Congratulations, it sounds like you have a lot to be thankful for this holiday season! That is one epic cinnamon roll! Perfect for Thanksgiving morning! Yes mam! It is perfect because you can take as little or as much as you'd like, so you'll have plenty of room for turkey! It is insanely good ;-) Thanks so much for stopping by! Oh My! This looks amazing. Can't wait to give it a try - Thanks! It is really good. especially warm so the glaze is gooey! I need to make another one already! I hope you love it! I see my Thanksgiving breakfast right here! I haven't made cinnamon rolls in awhile. Thanks for the inspiration. My boys will be SO happy. You are quite welcome! It is a perfect way to kick off the holiday! Chili's has a skillet cinnamon roll that my husband is always drooling over, so I know this will be a big hit with him! Pinned! Found you on Home matters Linky Party! Thanks for stopping by Trisha, I hope this hits the spot for your husband! I have had a lot of fun making big skillet cinnamon rolls this year. It is fun to have something a little different! You had my attention at pumpkin but you kept it at cinnamon rolls. Love this recipe and it looks easy to do. We always have our weekly sweet treat on Saturday morning while looking at the "big" paper and this would be a welcome addition !!! Thanks for sharing. Many good wishes for that sweet new addition to Lauren's family !! This would be a perfect Saturday morning treat! I love quiet mornings like that. Slowly reading the paper, eating a nice breakfast and not having to rush off sounds perfect! Oh my - Carlee. Your really have made me hungry and eager to do some baking this morning! 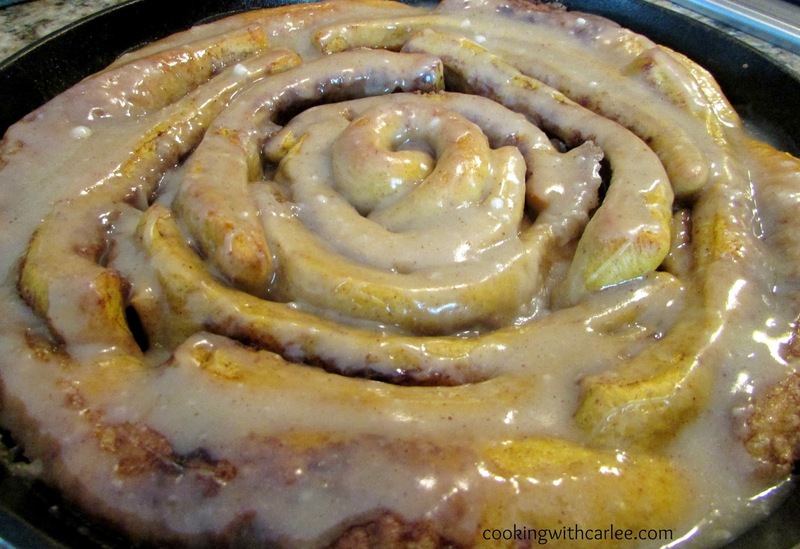 I've never made a skillet cinnamon roll - but this will be a recipe I will try! And I've never even heard of a virtual shower - how fun. I will be checking out all the links as soon as I get caught up enough with life to do so. Thanks! I love doing the skillet cinnamon rolls because you can cut a smaller (or larger!) slice. Plus they are fun to look at! This is my first virtual baby shower, I did it between two real life baby showers. There are so many babies coming in the next couple of months! This could bring me undone! Thanks for coming to the party with such a treat. It is worth it, that is for sure! Thanks for hosting! Oh my that looks good. Pinned! Thanks for sharing with us at #Throwback Thursday link party. Hope to see you again this week. Thanks so much for stopping by! I have a slight obsession with cinnamon rolls too. I used to not like bready ones, only ones made with biscuit dough. Now I love big soft bready cinnamon rolls! These look amazing! I love pumpkin and I never thought of pumpkin flavor in a cinnamon roll. Yummy and timely post to share on #TheLeisureLink! It adds a little seasonal touch to one of my favorite breakfast treats! Yum! You bake such wonderful desserts and this looks amazing. We can't wait to see what you will share next time. Thank you so much! We have been enjoying a few too many baked goods lately! Holy cow this sounds completely amazing!! YUM! This looks amazing!!!!! I always am looking for new ways to use my skillet! Thanks for sharing at the #HomeMattersParty - hope to see you again this weekend. I have been loving skillet cinnamon rolls. I think they are so fun to eat, the little layers are perfect! Thanks for hosting! Hi Carlee, I'm not feeling well so I could use some comfort food and this looks delicious. Thanks for sharing with us at #AnythingGoes and see you next week. I wish I could drop some by, I hope you feel better soon! Thank you also for sharing at #WednesdaysWisdom. I'd be ok with a visit to Australia! I am glad you are feeling better. 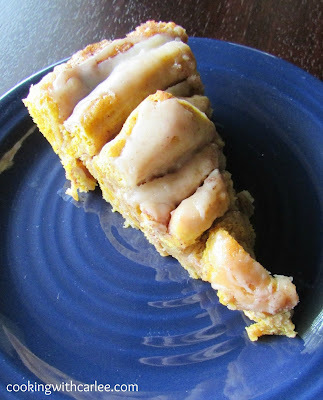 Everyone would love slicing a big serving of this pumpkin cinnamon roll on Thanksgiving morning!! What a great idea, Carlee! I know I would! Thanks so much! Perfect Holiday Breakfast! I love it! Yum! That looks delicious! Thanks for visiting Kim's County Line, too! I haven't had a cinnamon roll in ages and now you've got me craving one! This looks delish! Thanks so much for linking up at Share The Wealth Sunday! Cinnamon rolls are one our our favorites! This was was perfect for fall! You got me at pumpkin spice.....but then cinnamon and maple, my mouth is watering. Thank you for sharing with the Clever Chicks Blog Hop! I hope you’ll join us again next week! Thanks for hosting! It is a pretty perfect combination in my book! See you Sunday night. 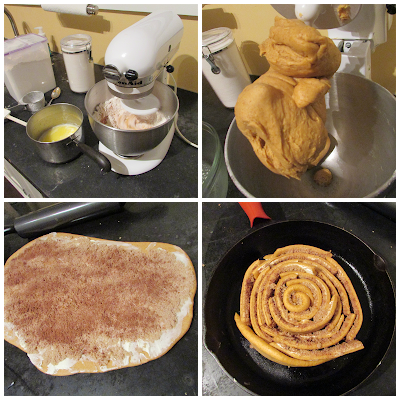 We are really into cinnamon rolls right now, and I love the idea of making one giant one in the skillet. Congrats on the #HomeMattersParty feature. Thank you so much! I love cinnamon rolls too and have really been enjoying making them this way. I think this would make a great breakfast treat, warming cinnamon to wake you up on a chilly autumnal morning sounds wonderful! It is just right for a cool morning! Thanks! Sounds delicious! Thanks for linking up to Home Matters Party. #HomeMattersParty http://cu-rio.net/home-matters-linky-party-60/ Congratulations on the feature! Yummy! As usual another tasty looking recipe! Hey Carlee if you ever need anyone to try out your creations... ;) How do you like the pumpkin taste in these? Thanks for partying with us at Talented Tuesday! I love it! The pumpkin itself is subtle, but it adds great color and just enough fall flavor. The pumpkin spice rounds it out a bit too, it is a nice change from plain cinnamon rolls! I could always use taste testers, you should move closer! I love this and will totally be making this! I'll be pinning this for later - and by later I mean probably tomorrow ;). Stopping by from the Country Fair Blog Party! Ha! I hope you love it! Thanks so much for hosting! If there was a winner for the whole internet, I think you may have just won! YUM! Thanks for sharing at Country Fair Blog Party! Seriously! I have a cast iron skillet now that needs to be used for this recipe! I can't wait for our December Party to see what you share next! Ha! Thank you so much! That is too funny! I love baking in my cast iron as much as I like to use it to cook. And cinnamon rolls are always popular! Thanks so much for stopping by, I can't wait for the December party!